No more butts, just stop smoking. Smoking is the greatest single cause of illness and premature death in the UK. You've probably thought about quitting, and maybe you've even tried once or twice (good on you!). It's a challenge that's really worth sticking with – you'll be wealthier and healthier, and whilst it won't save the planet single handed, it'll help to save a little patch of rainforest and hold back a little pollution. But the good news is that your body starts to bounce back the moment you quit. If you stop smoking before about 35, your life expectancy is only slightly less than people who have never smoked. And the younger you quit the better, so what are you waiting for? Tobacco plantations take up lots of space, which leads to deforestation and loss of biodiversity. And tobacco is a particularly greedy plant, consuming more nutrients than most other crops, and putting more strain on the land. The pesticides and fertilisers which help the tobacco to grow faster also contribute to land and water pollution. Of course, tobacco is not the only raw material that goes into cigarettes: cigarette-manufacturing machines use up to four miles of paper an hour. And when we've finished with them, cigarette butts are washed into rivers, lakes and the ocean where they are eaten by birds, animals and fish. £1,000 can buy you a lot of things. Use your imagination, what could you get with that money each year instead of it going up in smoke? Advertisers would like us to think that smoking is attractive, but not many people find stained teeth and stale-tobacco-smell alluring. You'll come up smelling of roses when you stop smoking. And you'll be able to smell and taste better too – so that romantic dinner date will be even more fun. Research shows that stopping smoking for 28 days means you are five times more likely to stay smoke-free. So if you can manage for our two month pledge period you're really on to a winner! 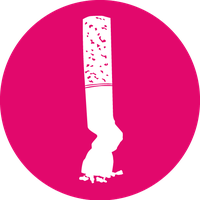 NHS's Smokefree website offers lots of helpful advice on how to quit, and they even have a 'Quit Kit' full of practical tools and advice. Avoid the triggers – throw out your ashtrays, lighters and cigarettes. If you usually smoke with your mates at the pub, give it a miss until the cravings die down. Start a new hobby which keeps your hands and mind occupied. Get active – it reduces the cravings. Reward yourself with something fun and sustainable with the money you save. Nicotine replacement therapy can be helpful in controlling cigarette cravings, but the jury's out on whether it's more effective in the long run than just going cold-turkey. Don't give up! Everybody falls down: the winners are the ones who pick themselves up and keep going. Personal sustainability is also important! Done - not great but not too badly. I have only bought two packets of cigarettes since starting the pledge so for more than 95% of the last two months haven't smoked at all. Well sometimes when people gather in a pub, I can't resist, but I have cut smoking to 2 cigarettes per month. I cut down by at least 50% most days, and some days I didn't smoke at all, and felt better for it, so I'm not going to quit trying to quit for good.